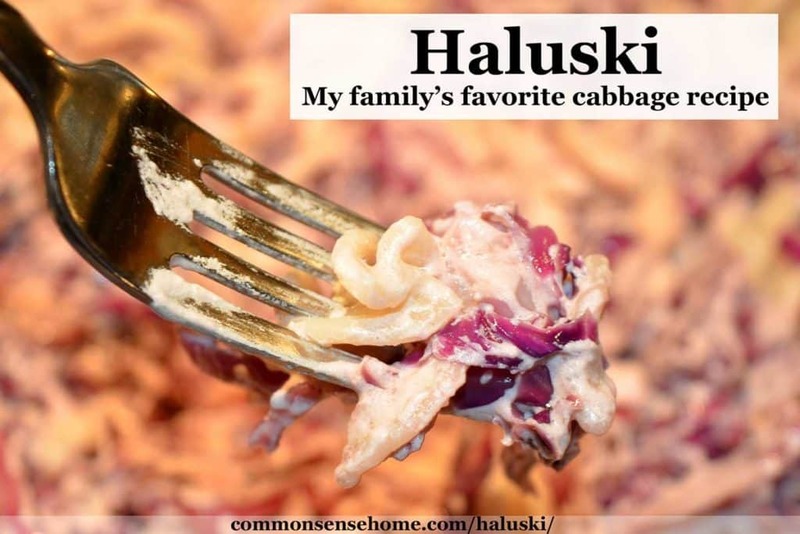 When I made haluski for the first time, the family's response was, “Ha-whata?” Now they ask for it by name when they know I'm picking cabbage, and even the youngest, my fussy eater, loves it. I kid you not – both boys ate leftover haluski for breakfast this morning. 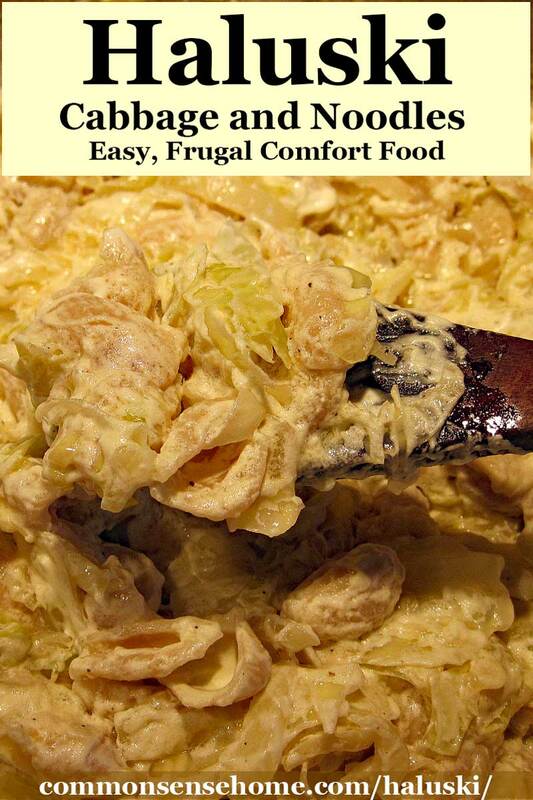 I make an assortment of things with cabbage, including sauerkraut and coleslaw, but this is one of our family's favorite cabbage recipes. If you want to make this recipe low carb, just skip the noodles and cut the sour cream by about half. You could use low fat sour cream, but it would make me very sad for you, because low fat products are filled with all sorts of weird things. If you wanted to try for casein free, you could probably cook the cabbage in refined coconut oil and try a dairy free yogurt instead of sour cream, but I'm sure the texture would be a little different. 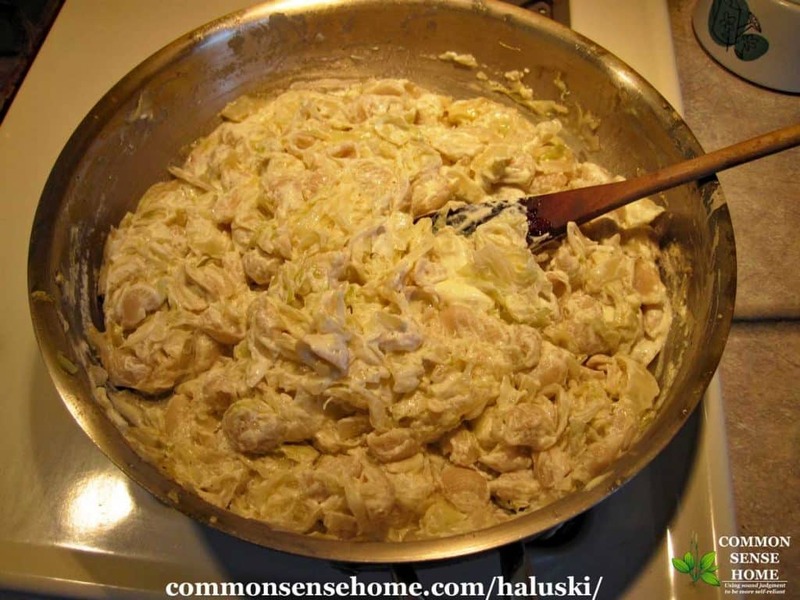 You can reheat your haluski on the stovetop or in the microwave (or just eat it cold), but don't overheat it or the sour cream will break and ruin the texture. Making gluten free haluski is easy with the rice noodles instead of wheat noodles. Lately I've been using the Tinkyada brown rice spirals or shells, but wide egg noodles are more traditional. 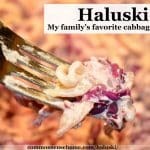 Note – I'm mixing photos from two different batches of haluski in this post, so that's why some photos have green cabbage and some have red. Don't skip lightly browning your onions and cabbage! It really adds that “extra something” to the flavor of the dish. Adapted from The Garden-Fresh Vegetable Cookbook by Andrea Chesman. In a large stockpot, put water to boil for noodles. Meanwhile, cut onion in half and slice thinly. Place butter and onion in large frying pan or Dutch oven. Saute onions over medium heat until onions start to get tender and caramelize. While onions are cooking, thinly slice or shred your cabbage. Aim for uniform slices/shreds for even cooking. 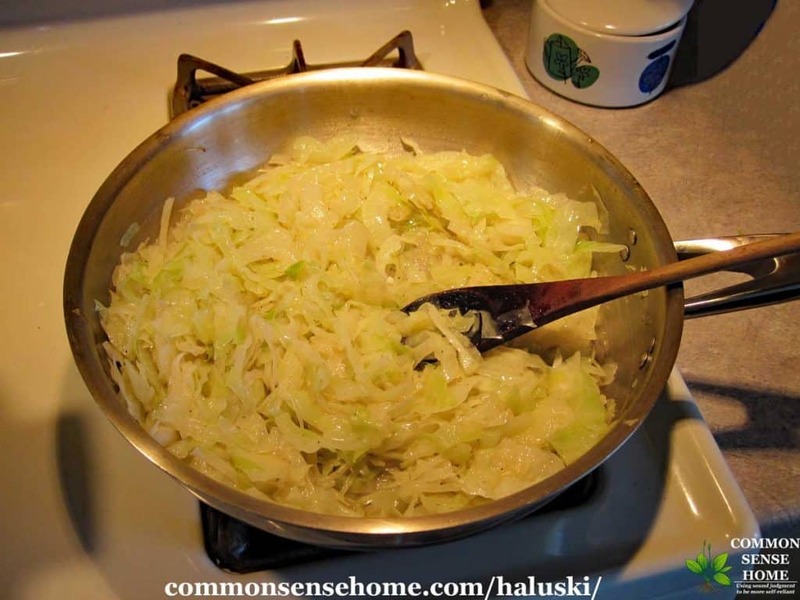 Add cabbage to pan with onions and butter. 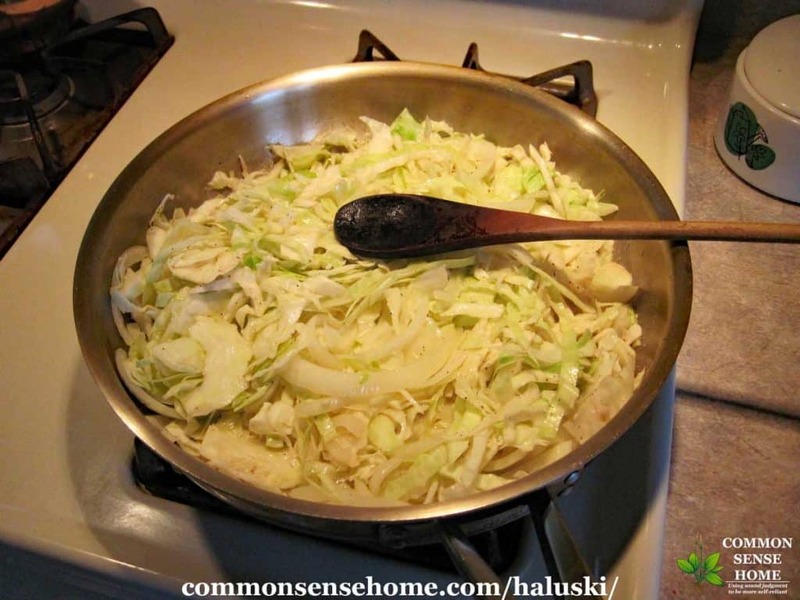 Cook the cabbage and onions 15-30 minutes, flipping and mixing regularly, until tender and showing a bit of browning. Meanwhile, cook noodles according to package directions. Aim for “al dente”, not well done, so they hold up better in the finished haluski. Drain well. Add the noodles to the cabbage mix (or the cabbage mix to the noodles, whichever way it fits better) and mix well. Add the sour cream and stir until distributed throughout the dish. Season with salt and pepper and serve immediately. Serves 6-10. Rich and creamy, budget friendly comfort food. My boys' favorite way to eat cabbage. Place butter and onion in large frying pan or Dutch oven. Sauté onions over medium heat until onions start to get tender and caramelize. Note: This recipe was originally published as “haluska”, but was updated to “haluski” as that is the more common spelling. Hi Laurie – I’m a cabbage virgin. This is the first year I’ve attempted growing it. And now finding what to DO with it all is the challenge. Thank you for this recipe – can’t wait to try it. Question: How do you best remove all the grit and critters from the cabbage before processing it? I generally strip off the outside leaves, which gets rid of quite a few hitchhikers. Then I rinse in cold water. You can keep an eye out for any unwanted guests and pick them off and trim damaged areas as you process. I had to make this! But of course, did not have sour cream and only lasagna noodles inda house. So, used plain non-fat sour cream and 3-4 T. cream cheese and broke up the lasagna. It’s delishous! I been a huge fan of sauteed cabbage and onions to a nice carmelized stage for many years but your recipe puts this right over the top! Oh and I had to use olive oil, outa BUTTA! STill really good. Thanks and keep up the good work. Sometimes you need to improvise. 🙂 Good food is still good food. If you needed to be dairy free you can make a nice creamy sauce with veggie stock, olive oil and nutritional yeast. It is very flavorful and sort of “cheesy” in a not cheese way. My kids love the stuff. Bobbi – I’m sure it would be similar, especially if you used a thicker or strained yogurt. This sounds wonderful! It might even convert my cabbage disliking hubby into a cabbage lover 🙂 I have way more cabbage than I can use in salads for my son and myself…so I will have to add sour cream to the grocery list! Laurie made this for dinner last Monday. It was delicious!! She gave me a head of cabbage from her garden so I can try this recipe at our home. All attending her dinner had second and third helpings! That DOES sound good. I had a roomate in college who was Dutch (family immigrated). Her Mom made something with mashed potatoes, cabbage and bacon that was incredible. I think it’s time to pick up some cabbage. Love this site, but this is the first time I’ve commented. I meant to tell Brigid that most recipe sites will include colcannon recipes. Only 4 ingredients, plus salt and/or pepper: mashed potatoes, fried cabbage, onions and bacon. Brigid …Potatoes prepared the way you describe is called Colcannon and was one of the ways the Irish varied their ways to cook them during their famine, according to what I read. My mom used to make this for us as children! Funny though, she was irish. After hearing about this a couple of times on your page and then my son had cabbage at a friends for their New Year’s meal. I am braving trying it. Houston actually is having some cooler weather and rainy so am hoping for a “comfort” food appeal. <3 what you have done with the website. Hope your weekend is wonderful and full of happy memories. Woot! Woot! I hope your family (and you) enjoy it! My family background is eastern european (Hungarian) and we make this with cabbage, onions, cooked bacon pieces and noodles – cooked, put altogether and baked in the oven. I look forward to trying your version! Just made this and almost followed the recipe except I added 8 ounces of softened cream cheese and WOW!! This is some good stuff. Thanks for sharing! You’re welcome! Pairing up with sour cream and cheese helps the body absorb the fat soluble vitamins, too. Can the haluska be frozen after cooking and cooled? I haven’t tried it, but I don’t believe it would work very well because the sour cream would separate and get clumpy. Good evening dear, I love all your post. With all the bad news on tv I couldn’t sleep so I’m looking over my e-mail. I’m reading about your coming thanksgiving and your mom and low and behold I see your recipe. You had me looking back to the sweet times I spent with my grandma. She would make her own egg noodles for everything and just the smell of brown butter onions will bring tears to my eyes. When she had cabbage ready in her garden I knew what was coming. We would spend hours talking, her showing me how to cook, I long for those day now. Anyway…….your recipe has sour cream, hers never did but the next time I will shirley try it. Bless your heart and your home and family. And make good food and with good memories for your kids, they will remember. Thank you, Karen. The boys are pretty good help in the kitchen now, and they love showing off their cooking and the things they grew in “their garden” to grandma and grandpa. Above all, they appreciate the taste of good food, simply prepared, shared with good company. I am thankful that we are once again able to eat supper as a family every night since my husband is home again. Thank you for sharing your memories. How many cups of sour cream? It is not sold in cartons or pounds here – just plastic with metric measurements. It’s about 2 cups. My container says 454 grams. I do the cabbage and onions, sometimes I add kolbasi that has been browned. Instead of noodles try using onion and potatoe perogies that have been fried until defrosted! When I make cabbage noodles I add a handful of cream of wheat when browning the cabbage and onions. It adds a nutty flavor to the dish. The recipe was given to me by my mother-in-law, whose family is from Magyarpolany, Hungary. That is interesting. I’ve never heard of that before. This sounds delicious! It has all the same things I use when I make sauerkraut perogies, just in a different form. Yum! Believe it or not, I have never made perogies, although I have had them served at community functions. Pure comfort food.